It’s what happens when a committee of nine tries to do the 21st century equivalent of screwing in a light bulb: come up with a web address to describe itself. Simple as the exercise may be, Flagler County’s fledgling jobs council—more prosaically known as the Economic Opportunity Advisory Council, or EOAC—couldn’t do it Wednesday morning. In a discussion lasting almost 30 minutes, the council’s members suggested all sorts of options, each proving too long, too vague, too unwieldy, not descriptive enough, until one of the nine suggested the job be delegated to the county’s administrative staff “not only to do but to implement.” (By staff, the council means Donnie Wines, the administration’s one and only web guru.) So it was. The council is looking to have a clear imprint on the web, where its presence has been either missing entirely or mirroring the old pages of Enterprise Flagler, the private-public economic development partnership Palm Coast and the county abolished last summer. 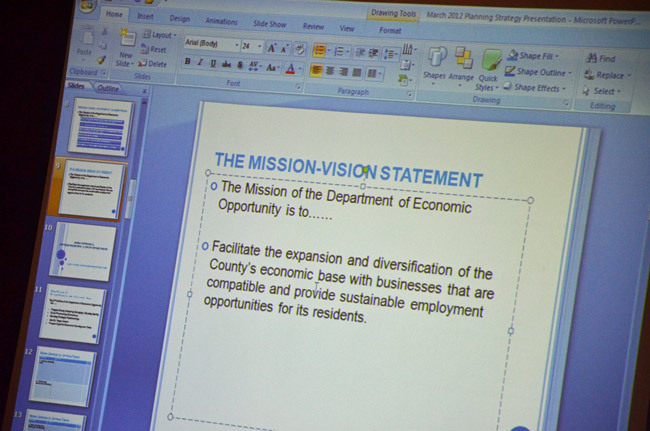 The council then took on its mission and vision statements, which it drafted at a day-long retreat last week. In the interim, some council members freelanced their own proposals to Helga van Eckert, the department director, who brought them up for discussion. “I often wonder how often these things get looked at once they’re adopted,” Brabara Revels, who chairs the council, said. The alternative drew little enthusiasm. The original proposal was adopted unanimously. Again, a brief discussion led back to the original statement, which was formally adopted. The group gave its March 28 retreat a brief overview, essentially adopting van Eckert’s minutes from that retreat as its guiding document (see below). “You have to remember this really is a living document,” van Eckert said. Toward the end of the meeting Doug Baxter, president of the Flagler County Chamber of Commerce, spoke disappointingly of a recent “hire-a-hero” job fair that drew just 18 veterans and 16 employers, though some 250 jobs were available. The 90-minute meeting was otherwise uneventful. Was this meeting announced to the residents tax payers so they could attend? How come so very few were present? Two meetings, to just come up with a mission statement? When are they going to seat at the phones and the computers online and start contacting potential out of state business to move over to Flagler? Too much noise and zero results so far. Research the local outsourcing still taking place at government level and big for profit and “so called” non profit corporations and or entities and convince them to use the local suppliers and hundreds of local jobs will be created, out of the dollars we spend with them. Where was the job fair held and who organize it? Because may be is the reason why more veterans didn’t attend? Regarding the 16 employers, probably are all what is available in Flagler with job openings. I am trying to give Ms van Ekert the benefit of the doubt but, we are over 9 grand in on her salary so far and we have day long retreat and a mission- vision statement to show for it!!! RESULTS are what we are looking for !!!! This place is like the Miami Dolphins, nobody wants to come here!!!! A $110,000 salary and she can’t choose an appropriate domain name? At worst, she should have brought three options for the council to choose from. At best, she should have just unveiled the new domain name and direction of the new website. Can you say Micromanage? Why did we spend so much money if the part time volunteer council is going to hash over every little detail. Let her do her job. Maybe they just need an executive assistant to cary out their wishes. Unless…they need a fall person to take the blame when their great ideas don’t pan out. By the way, the council members that recommended the alternative vision statements need to be removed from the council immediately. Great resident statements, bad economic development statements.